This post is in response to Hard No Sports. When people find out that I’m a wrestling fan – and an avid one, at that – I’m often asked “why?”, especially when you consider that 24 year old women are hardly the target demographic. It’s comprised of multiple factors, some that make sense and some that don’t at all and leave people who don’t quite understand the allure of wrestling a little perplexed. Okay, so let’s get the obvious out of the way: I know it’s fake, believe me, we all do. We aren’t stuck in the 60s any more, the Internet has well and truly killed any chance of that being a legit argument for why you shouldn’t watch wrestling. It doesn’t even factor in as a thought to the people who enjoy it, it only seems to be an issue to people who don’t watch it. So we know it’s fake, why still should we watch a “sport” that’s fake with pre-determined outcomes? Because it’s ‘sports entertainment’, it’s even labelled as such. The perfect mixture of athleticism and stories and characters that develop over months and years. It’s the perfect mixture of comic book-esque characters (babyfaces, heels, factions, etc) and an exciting feeling of professional athletes putting their bodies on the line each and every week. Because if there is one thing that definitely isn’t fake about pro wrestling, and especially the WWE, it’s that they have some of the best male and female athletes in the world who excel at telling stories in and outside of the ring. Why do you watch films, long running TV shows or read trilogies of books? Because it’s the characters you end up loving and rooting for. You’ve patiently sifted through seasons of a show, or chapters of your book, in the hope that the character you resonate with on an emotional level finally gets their pay off. Sometimes that doesn’t always happen in pro wrestling (and I could write endlessly on stories that I felt were badly done, unfinished or completely ignored) but when it does work out, it’s incredible. I remember the first Wrestlemania I watched after fully immersing myself back into the culture of WWE after a 10 year hiatus. It was WM30, and everyone was rooting for Daniel Bryan. I had only been watching WWE again for a few months, but in that space of that few months, I had become emotionally attached to the character of Daniel Bryan, who was always pushed back, always told he wasn’t good enough and always fighting for what he believed in. It resonates with us all because we all feel like the underdog in some aspects of our lives, and we all wish we could get to the top to finally prove those doubters wrong. And that’s what WWE conveys so well: The story of the underdog finally overcoming the odds to be the best. When Daniel Bryan won the title, I was elated and I consider it one of the best matches and main events of WWE’s history, purely because of the context and development that went into this huge moment. The story of Daniel Bryan spanned years and in that moment, he finally achieved everything he dreamed of, and the fans achieved the excitement and gratification that our hero, our boy Daniel Bryan, finally got what he deserved. 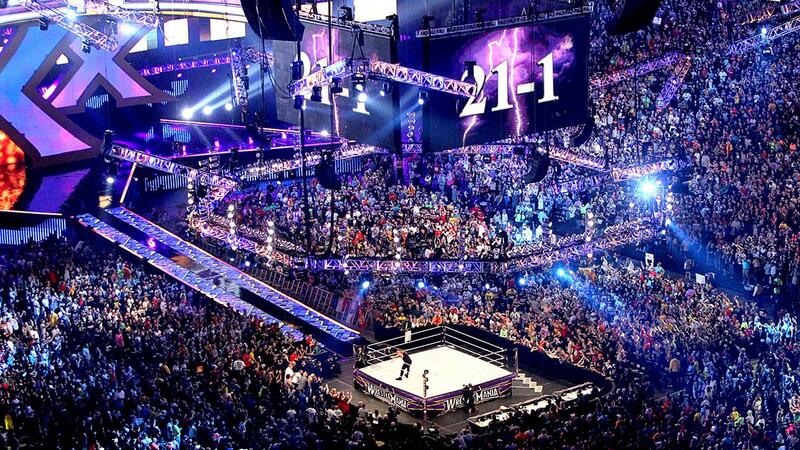 WM30 was also special for another reason: The Undertaker lost his 21 year undefeated streak. 21 years of defeating every high level opponent at Wrestlemania came to an end at the hands of Brock Lesnar, an event that shocked every wrestling fan around the world. The Undertaker was immortal and considered to be unbeatable at WM, in a story that developed over 20 YEARS. When something that has lasted 20 years comes to a shocking end, there will be a huge emotional fall out; especially when you consider The Undertaker’s career has spanned longer than some of his fans have been alive, with his début in the WWE being a year before I was born. There are many reasons why people love pro wrestling and WWE, and it’s different for every single one of us. For me, it started when I was a child and saw Mick Foley thrown off the top of a cage. From then on, I was hooked. The raw emotion from seeing that is something I couldn’t even fathom at the time. It’s fun, silly and rewarding at times. And for me, there’s nothing more fun than organising a party on the first Sunday of April every year to watch Wrestlemania live with your equally-obsessed friends. And if you made it this far, and you’re still not sold, then watch Wrestling Isn’t Wrestling by Max Landis. It explains wrestling in a way I never truly could and shows us exactly what the allure is.